Esophagogastroduodenoscopy (/ɪˌsɒfəɡoʊˌɡæstroʊˌduːoʊdɪˈnɒskoʊpi/), (EGD) also called by various other names, is a diagnostic endoscopic procedure that visualizes the upper part of the gastrointestinal tract down to the duodenum. It is considered a minimally invasive procedure since it does not require an incision into one of the major body cavities and does not require any significant recovery after the procedure (unless sedation or anesthesia has been used). However, a sore throat is common. Gastroscopy or duodenoscopy is performed for a number of indications, one of the most common being in unexplained anemia where it is used to diagnose gastric or duodenal ulcers among other things. Problems of gastrointestinal function are usually not well diagnosed by endoscopy since motion or secretion of the gastrointestinal tract are not easily inspected by EGD. Nonetheless, findings such as excess fluid or poor motion of the gut during endoscopy can be suggestive of disorders of function. Irritable bowel syndrome and functional dyspepsia are not diagnosed with EGD, but EGD may be helpful in excluding other diseases that mimic these common disorders. The tip of the endoscope should be lubricated and checked for critical functions including: tip angulations, air and water suction, and image quality. In its most basic use, the endoscope is used to inspect the internal anatomy of the digestive tract. Often inspection alone is sufficient, but biopsy is a valuable adjunct to endoscopy. Small biopsies can be made with a pincer (biopsy forceps) which is passed through the scope and allows sampling of 1 to 3 mm pieces of tissue under direct vision. The intestinal mucosa heals quickly from such biopsies. Endoscopic image of Barrett's esophagus, which is the area of red mucosa projecting like a tongue. 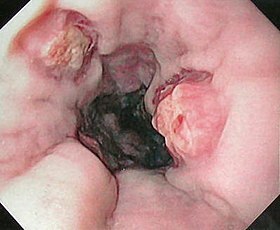 Endoscopic still of duodenum of patient with celiac disease showing scalloping of folds. Gastric ulcer in antrum of stomach with overlying clot due to gastric lymphoma. Endoscopic images of an early stage stomach cancer. 0-IIa, tub1. Left column: Normal light. Right column: computed image enhanced (FICE). First row: Normal. Second row: Acetate stained. Third row: Acetate-indigocarmine mixture (AIM) stained. Esophagogastroduodenoscopy (EGD) or oesophagogastroduodenoscopy (EGD or OGD) is also called panendoscopy (PES) and upper GI endoscopy. It is also often called just upper endoscopy, upper GI, or even just endoscopy; because EGD is the most commonly performed type of endoscopy, the ambiguous term endoscopy is sometimes informally used to refer to EGD by default. The term gastroscopy literally focuses on the stomach alone, but in practice the usage overlaps. ^ "Gastroscopy – examination of oesophagus and stomach by endoscope". BUPA. December 2006. Retrieved 2007-10-07. ^ National Digestive Diseases Information Clearinghouse (November 2004). "Upper Endoscopy". National Institutes of Health. Retrieved 2007-10-07. ^ "What is Upper GI Endoscopy?". Patient Center -- Procedures. American Gastroenterological Association. Archived from the original on 2007-09-28. Retrieved 2007-10-07. This page was last edited on 5 January 2019, at 23:10 (UTC).